This online publication (DS 144) provides the digital database for the printed map by Edward W. Wolfe and Jean Morris (I-2524-A; 1996). This digital database contains all the information used to publish U.S. Geological Survey Geologic Investigations Series I-2524-A (available only in paper form; see http://pubs.er.usgs.gov/pubs/i/i2524A). The database contains the distribution and relationships of volcanic and surficial-sedimentary deposits on the island of Hawai‘i. This dataset represents the geologic history for the five volcanoes that comprise the Island of Hawai'i. The volcanoes are Kohala, Mauna Kea, Hualalai, Mauna Loa and Kīlauea. 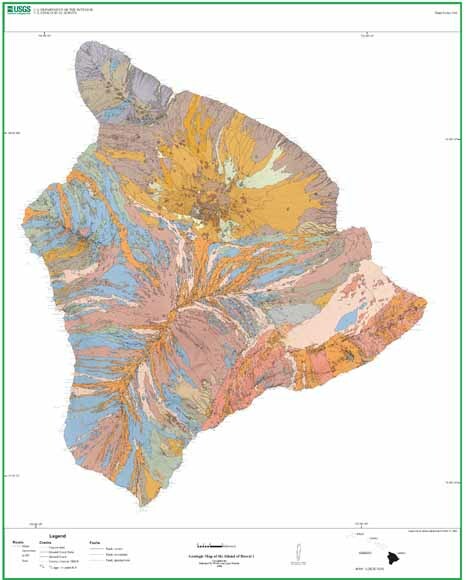 This database of the geologic map contributes to understanding the geologic history of the Island of Hawai‘i and provides the basis for understanding long-term volcanic processes in an intra-plate ocean island volcanic system. In addition the database also serves as a basis for producing volcanic hazards assessment for the island of Hawai‘i. Furthermore it serves as a base layer to be used for interdisciplinary research. This online publication consists of a digital database of the geologic map, an explanatory pamphlet, description of map units, correlation of map units diagram, and images for plotting. Geologic mapping was compiled at a scale of 1:100,000 for the entire mapping area. The geologic mapping was compiled as a digital geologic database in ArcInfo GIS format. A page-sized PDF version of the geologic map for viewing: bimp_thumb.pdf (584 KB). A PDF version of the geologic map (scale 1:150,000): bimp.pdf (9.3 MB). A PDF version of the description of map units: bimp_dmu.pdf (1.6 MB). A PDF version of the correlation of map units diagram: bimp_corr.pdf (5.4 MB). Miscellaneous layer and legend files to symbolize the coverages. A database file containing major element oxide abundances for geochemical samples (bimpchem) is provided in bimpchem_tbl.dbf.